It’s amazing what difference making a decision can make to project. After languishing, neglected, in the yarn basket, my ripple blanket is making some rapid progress – 2.5 rows in a day, which isn’t bad for a blanket 280 stitches across! That grey really wasn’t sitting right with me, and I truly do feel happier with the blue – talking (or blogging) out loud is a great way to make the decision you already know you need to make! So thank you everyone who kindly left input and helped me out. The pattern I’m using is this very easy to follow pattern by Attic 24. 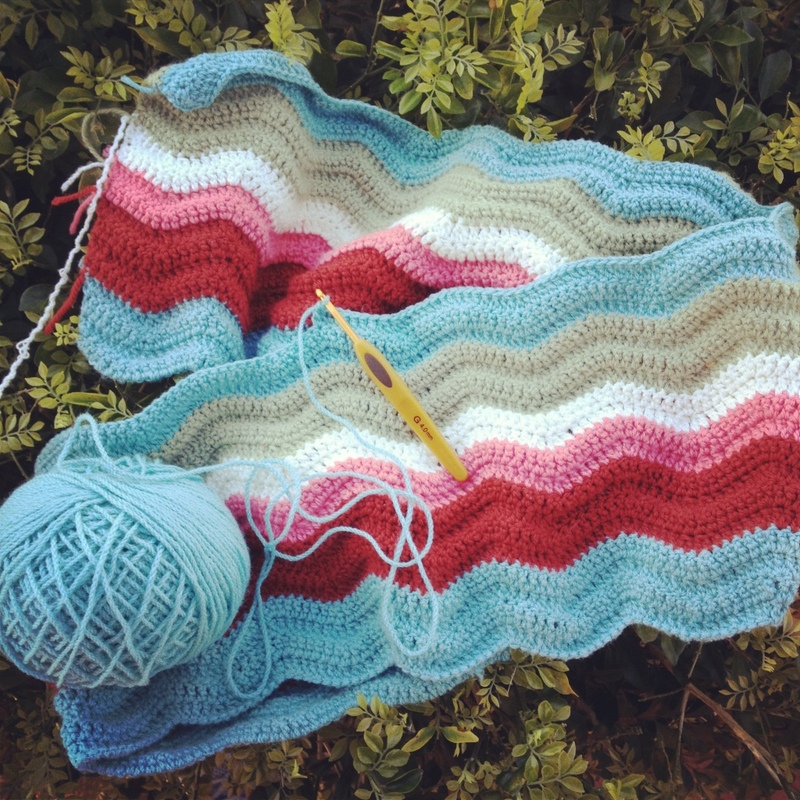 I think most people starting a ripple for the first time find themselves using this pattern, it certainly seems to be very popular, and with good reason – lots of photos, and clear explanation of the stitches. If you are thinking of rippling, I recommend checking it out. A ripple can seem quite daunting at first, especially when you realise the number of stitches involved – the foundation chain needs to be in multiples of 14 (plus 3 turning chains), and for my little lap size rug, I ended up with 280+3 in my foundation chain. To get the length, I simply lay the chain over my lap until it seemed long enough that I could give in to my boredom with chaining and call it long enough. I was concerned about the counting and making sure I had an accurate idea of how many stitches I was starting with, so to avoid having to constantly recount, I added a stitch marker at the end of every group of 14. And because I’m so high tech, I used safety pins as my markers. This took off the counting pressure, and then I could simply concentrate on length, knowing as long as I completed a full group of 14, my starting chain would be correct. After being queried on why there were safety pins in my chain, I had friends take on a similar idea, and they pinned every 20 stitches, knowing that they wanted 280-300 stitches. Same theory. The second reason I chose to use every 14 stitches as my marker, is then on the first row, I then was able to see very quickly if my “peaks” were in the right spot. As I added rows, I removed every second pin each pass across, as I slowly got used to what the peaks and valleys looked like, and still with the safety of a known point to return to should it all get mixed up. By row four, I was used to the stitches enough, that I could go pin free. I still make a point of double checking on every valley, that the stitches are going into the right place in the row below. Occasionally I’ll find I’m out of whack a stitch or two, and it’s then only a matter of frogging the last few stitches back to the error – but I never have to correct more than 14 stitches at a time. And finally, the edges. It seems to be quite common to find the edges waver in and out. My own ripple has a couple of issues early on, but nothing significant – in fact, it’s highly likely only I notice them, but when I laid my ripple next to Car’s, it was obvious. That girl is a machine – her edges are 100% straight. Her little hint, which I’ve used since with great success, is to be fastidious when it comes to joining into the turning chains. And she was right – when I looked at my issues, it was where linking into both loops of the turning chain had been too hard and I’d just gone through the space instead. Linking one loop works ok, but taking the time to link through both loops really pays off. I’m not an expert, far from it, but these little tricks have been a big help to me as I work my way through the blanket, and I hope they might be a help to you too! Very nice crocheting there. Wow 280 stitches eeekk, Keep going it will be worth it. Oh good luck with Blogtoberfest, I’m joining in as well. Thanks Beky! It does feel a bit of a mammoth run across those 280 stitches, but once I’ve got a run on, it actually crotchets up reasonably quickly. Good luck with your blogtoberfest too! Thanks Kelli, I’m happy with how it’s coming up! Aww! mines not perfect 😉 but thNks for the compliment, will be blogging my progress this week – its about 34″ now!